I have had little time for writing up my blogs or posts. Life has been hectic with guiding and fishing. I have been fortunate to be able to fish the H.Avon a good few times too. 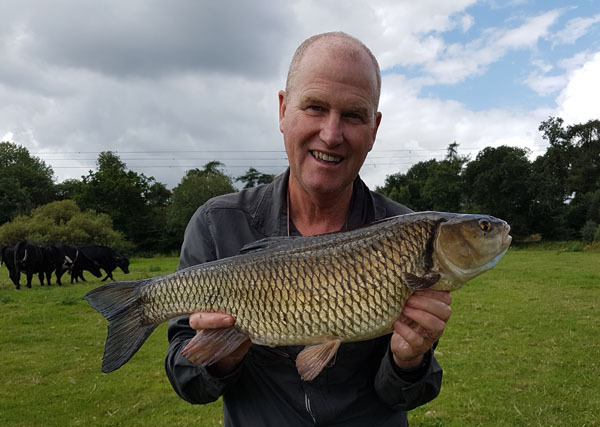 I have been fishing with Andy (you should have been here yesterday) Cowley for most of the time and in August Mark Woodage decided to start his campaign on the river. During the month the rain had fallen however insufficient enough to increase the height much or add colour. The conditions have been great for fish spotting but difficult to catch them. Having said that I’ve had some great days but it’s been one fish wonders as I call them. Sometimes though it is pure luck involved in catching them. Take the barbel for instance I’ve caught probably 8 barbel and not one of them have been double figures. This is funny as most of the swims I’ve fished with these barbel had doubles swimming with them. So unlucky for sure, but every barbel caught from the river is a great result and they are beautiful looking fish. Most of the swims also contain some good chub well over 6lbs it’s these that I’ve been chasing. No sign of a 7lber yet but they are putting on the weight right now and come October there will be some real beasts around for sure. Most of the time I’ve been using the West Country baits elips pellets in 6mm size. The barbel and chub just can’t resist them. I’m not going to write too much about each fish capture as detail is lost. There are a couple of captures that are worth recording as a story. I was fishing one stretch were there are some big chub and some smallish barbel. It was a run under my own bank with reeds chest high protecting visibility from the fish. You can see the fish pick up the pellets so it’s very interesting seeing the antics that they get up too. There were a couple of chub that I though might be 4-5lbs that kept coming in and picking up the pellets. They were playing games with me. However one picked up the hookbait and the alarm sounded. My hearing is so shot I can’t hear the free spoils on my reels so I’m relying on the ATTX’s for the indication. The fight was good as the chub pulled for freedom and I could see it getting into the strands of weed and each time I pulled it out. I thought the fight was really good putting it down to the fast shallow water under my bank. The rod was hooped over and I enjoyed every minute. Thinking it was about 5lbs there was no pressure to land the thing. Slowly it came towards the net and I though it looks a bit bigger than a 5lber. In the net and upon lifting it out I realised it was a good fish. On the scales it went 6lbs 10oz and looked a beast. A quick phone call to Andy and he kindly came along and photographed the fish. The thing was 23 inches long and thin so when at it’s peak weight it could be over 7lbs. 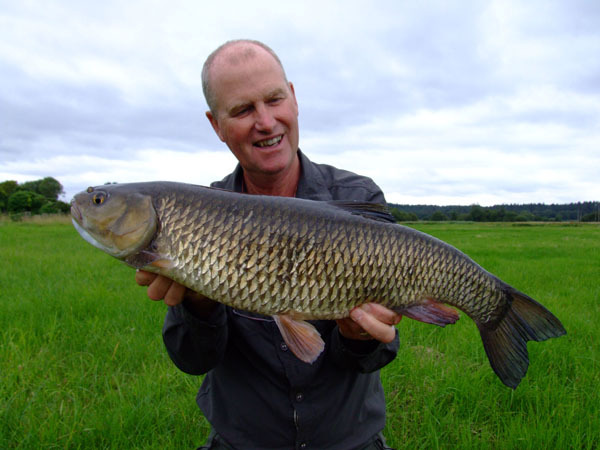 Another story about a large chub and barbel. Mark was fishing further upstream from me and was struggling for barbel. 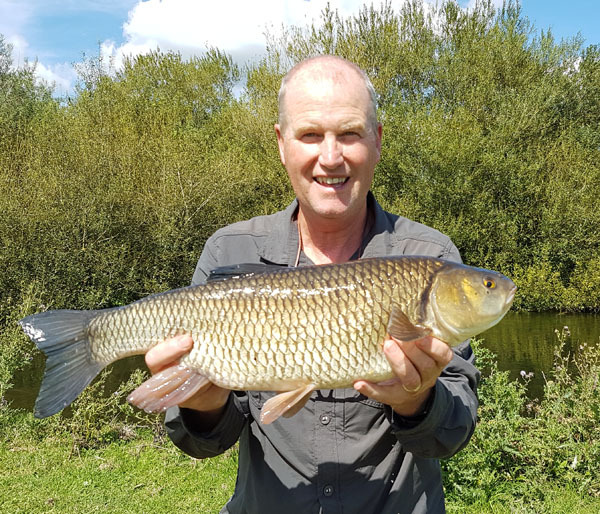 I was fishing the same stretch and had a very large chub and 4 double figure barbel mopping up the pellets under another swim where the river’s flow was under my bank. This was very exciting watching the barbel travel around the swim at first not feeding but I think they were feeling for a line in the river. This continued for about 1 hr. the chub would just follow them around. Then like a switch the barbel began feeding well under some weed at my feet. 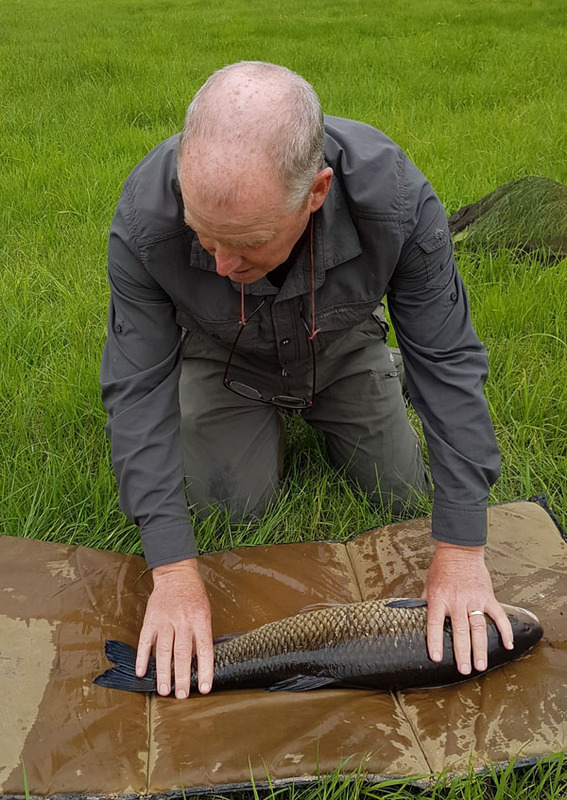 So I carefully lowered in my hook bait and rig when the barbel had vacated the swim and the weed parted so as I could lower in the lot without making a plop or noise at all. I sat back from the rod only looking occasionally to see if the barbel and chub were feeding and sure enough they were. It was time to phone Clive Shipman to talk about a stretch of the river Severn I’m fishing in the autumn. We were on the phone for a good period of time when the ATTX burst into life. I said to Clive got to go I got a bite, I was totally surprised to be fair. Like a coiled spring I was soon on the rod and the fish powered off and I was hoping it was the chub. Then something caught my eye and it was Mark standing behind me. He said he came for a look at the swim as I told him about the barbel. He said he heard the alarm and was only a few yards away. I must have been focused on the rod as I didn’t see him. The fish was pulling hard and the clutch was ticking nicely. 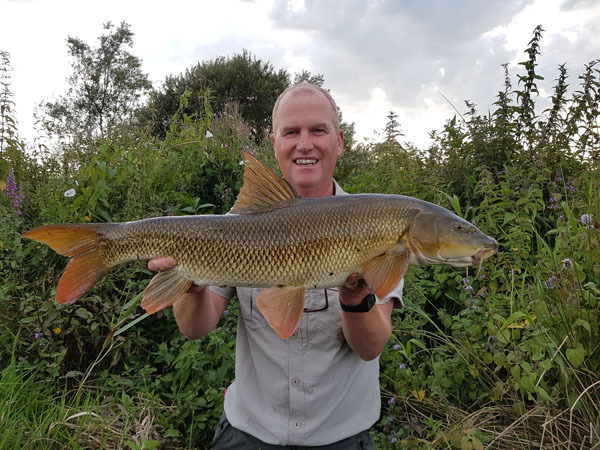 We could soon see it was a barbel and the thing had to be kept on a tight line as just downstream there was thick weed and I would have trouble extracting it from there. The barbel kept plugging away in and out of the weed under my feet and bank. It wasn’t the monster one I had seen but any barbel from the H.Avon is a great result. There have been some good chub in a swim I have had been feeding as has everyone else. A 7lber came from here at the start of the season however there are a good few 6lbers and some good 5lbers as well. It’s a far bank cast near some willows. You can see the chub come out to feed and hook themselves. It’s exciting fishing to say the least. You need to be on the ball as once hooked they flee straight into the willows at an alarming speed. I have been lucky enough to catch 2 6lbers from there this season. The first one at 6lbs 3oz that followed by another of 6lbs 6oz. You normally catch a couple of chub then they refuse to come out from under the willow for the day and it’s time to move on. Then there are other barbel that turn up while chub fishing. On my last visit I returned to the swim where I caught the 9lbs 8oz barbel and 3 other doubles swimming around plus that big chub. Just the chub were present and no barbel. Funny they can’t be far away, having said that my shadow from the early sunrise had it going out across the river. Andy was fishing on the opposite bank and came around to see the none existent barbel. We then walked miles putting bait in only to see chub and no barbel. Some good chub again. There is one swim that he and me are gagging to fish however there is a very active black bull that’s keeping us out of the field. We then went our different ways I found a few chub and barbel and caught 2 barbel with the largest being 7lbs 14oz. Again doubles were present but only the fool hardy little ones are getting caught. 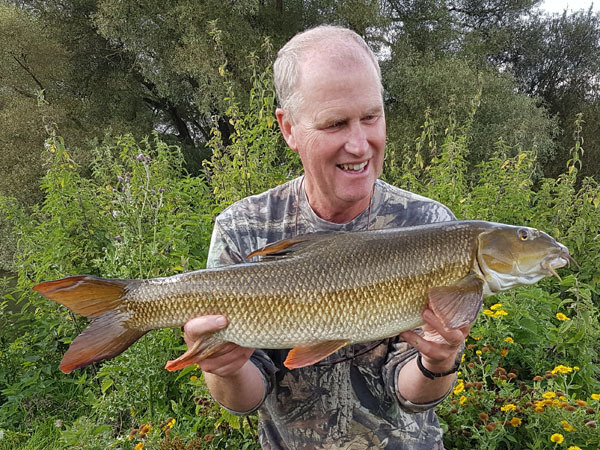 We are entering a great point in the season now as the weed is dying back on the river and the chub and barbel will be having a good feed before winter. A few frosts will no doubt mean the float rod coming out and maggots used for those chub. Best not to wish your time away though. This entry was posted on Sunday, September 3rd, 2017 at 1:01 pm	and is filed under Uncategorized. You can follow any responses to this entry through the RSS 2.0 feed. Both comments and pings are currently closed.